Tyler Rollins Fine Art is pleased to present NAMA, a solo exhibition of new works by FX Harsono, one of Indonesia’s most revered contemporary artists, taking place at our gallery in New York from April 25 – June 7, 2019. The public is cordially invited to attend the opening reception on Thursday, April 25, from 6:00 to 8:00 pm; the artist will be in attendance. Harsono has been a central figure of the Indonesian art scene for over 40 years. In 1975, he was among a group of young artists who founded Indonesia’s Gerakan Seni Rupa Baru (New Art Movement), which emphasized an experimental, conceptual approach, the use of everyday materials, and engagement with social and political issues. Over the course of recent decades that have seen enormous transformations in Indonesia, Harsono has continuously explored the role of the artist in society, in particular his relationship to history. During Indonesia’s dictatorial Suharto regime (1967-98), his installation and performance works were powerfully eloquent acts of protest against an oppressive state apparatus. The fall of the regime in 1998, which triggered rioting and widespread violence, mainly against Indonesia’s ethnic Chinese minority, prompted an introspective turn in Harsono’s artistic practice. He embarked on an ongoing investigation of his own family history and the position of minorities in society, especially his own Chinese Indonesian community. The recovery of buried or repressed histories, cultures, and identities – and the part that the artist can play in this process – have remained a significant preoccupation. Through looking into his own past, Harsono has touched on concerns that resonate globally, foregrounding fundamental issues that are central to the formation of group and personal identities in our rapidly changing world. 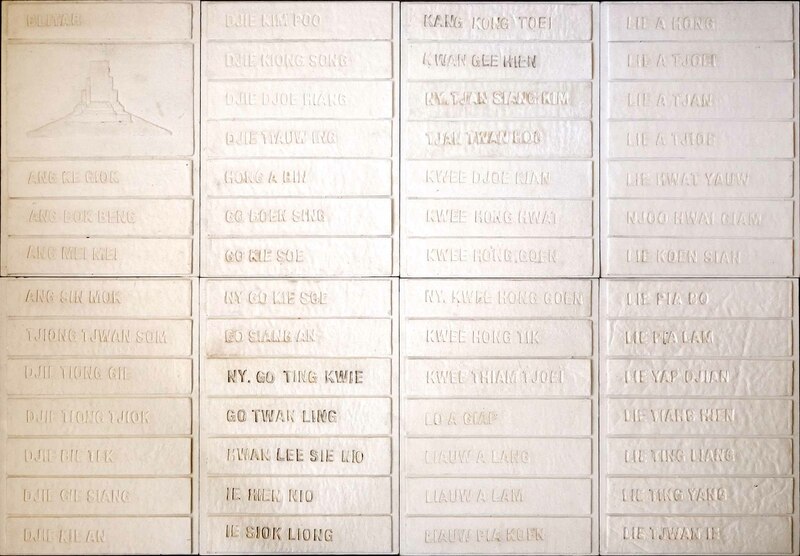 The current exhibition, NAMA (“names” in Indonesian), focuses on Chinese Indonesian personal names and their function as both markers of identity and symbols of remembrance. During the Suharto period, Chinese culture was suppressed in Indonesia, and Chinese Indonesians were required to change their names to more typical Indonesian ones. This attempt at the erasure of identity through legalized oppression harkened back to the more violent hostilities against the Chinese Indonesian community in the late 1940s, when many thousands were massacred during the unrest of the national independence movement. The exhibition centers on a video in which Chinese names are recited as a litany and then replaced with Indonesian names. “The chanting of prayers invites us to contemplate, without anger or revenge, the forced act of changing one’s name, which resulted in the Chinese being uprooted from their traditions,” Harsono explains. Other works explore the physical forms that names can take, as seen in memorial inscriptions, written signatures, official documents, and even embroidery. A large wall installation functions as a memorial monument to the massacre victims, its delicately embossed paper panels symbolizing fragility and vulnerability. A series of paper collages and light boxes incorporating texts and images pay tribute to individuals, both victims and survivors, commemorating the specificity of personal tragedies alongside the collective loss, and bringing light to a past that had long been consigned to darkness. In recognition of his decades long “commitment to art and to freedom of expression in art,” Harsono was awarded the Joseph Balestier Award for the Freedom of Art in 2015, presented by the US embassy in Singapore, and in 2014 he was given the Prince Klaus Award honoring his “crucial role in Indonesia’s contemporary art scene for forty years.” His work has been shown in over 100 exhibitions around the world, including the seminal Traditions/Tensions: Contemporary Art in Asia at Asia Society in New York (1996), and the first Asia-Pacific Triennial of Contemporary Art in Brisbane, Australia (1993). The Singapore Art Museum mounted a major mid-career retrospective, FX Harsono: Testimonies, in 2010. He presented his first solo show in the United States, Writing in the Rain, at Tyler Rollins Fine Art in 2012; and in 2018 the main video from that exhibition was featured in a month-long screening in New York City’s Times Square. In 2017 his work was included in two major survey exhibitions: SUNSHOWER: Contemporary Art from Southeast Asia 1980s to Now at the Mori Art Museum in Tokyo; and After Darkness: Southeast Asian Art in the Wake of History at Asia Society in New York.